If you’ve driven for any amount of time, you’ve likely backed your car into something you couldn’t see was there. It’s one of the most common crashes that can cause hundreds or thousands of dollars worth of damage. The Insurance Institute for Highway Safety (IIHS) has recently launched a new consumer rear crash prevention rating program to help you identify models having technology that can prevent or mitigate low-speed backing crashes. IIHS found the Subaru Outback scores highest in their new testing. 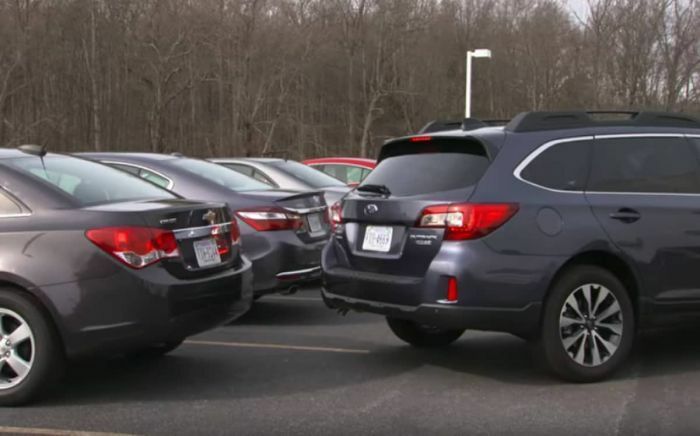 IIHS testing says the Subaru Outback gets the highest “Superior” rating because the vehicle can avoid a crash or substantially reduce speeds in many of their test scenarios, which involve multiple runs at about 4 mph. It’s all because of Subaru’s new Reverse Automatic Braking system. In these recent IIHS tests, the new 2017-2018 Subaru Outback is rated one of the safest vehicles for preventing rear crashes from occurring. When Outback comes equipped with Subaru’s Reverse Automatic Braking, it gets the IIHS’s highest marks. For added safety, Outback also comes standard with a Rear-Vision Camera. All Outback trims now come standard with a Rear-Vision Camera enhancing rear visibility when backing up. Its display includes guidelines to help you see the vehicle’s path and judge distance to other objects. When equipped with available Reverse Automatic Braking, Outback can even stop itself to avoid objects behind while in reverse. Reverse Automatic Braking is standard on Outback 2.5i Touring and 3.6R Touring. It is available on 2.5i Limited and 3.6R Limited trims. The Outback isn’t the only Subaru model available with Reverse Automatic Braking. It is also offered on the Subaru Forester, Crosstrek, Legacy, Impreza and Subaru WRX. None of these vehicles were tested by IIHS, but if they were, they would also receive a “Superior” rating. With the introduction of Subaru’s EyeSight driver assist system in 2012, the Japanese automaker is a leader in safety. The latest Driver Assistance feature, Reverse Automatic Braking, is another line of defense protecting consumers from trouble you don't see coming. Thanks to this new system, the 2017-2018 Subaru Outback is rated highest by IIHS. Watch: What is Subaru Reverse Automatic Braking? (New 2017 Safety Feature) video.